Happy December, everyone! Today begins another giveaway, and we’re giving the winner a choice between the holiday gift boxed Dino Bone, and the Rocky’s Rollers. A tripawd friend of ours has recently tried each. You should pop over and see what he has to say about them. Wyatt is a handsome beast. The Dino Bone certainly made him smile. 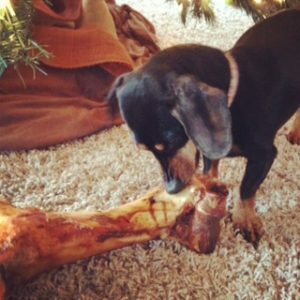 Do y’all remember the little Dachshund who thought the Dino Bone was hers? I brought it for her Pit Bull sibling, but she claimed it as her own and guarded it jealously. Cosette dragged it under the Christmas tree and wouldn’t stop gnawing on the Dino Bone. Good dog! As Wyatt says, good dogs deserve good treats. The Dino Bone from Jones is a good treat! Why? Let’s run down what we know about the Dino Bone. Has your dog been good this year? Is your dog a voracious chewer? Does your dog need something to both keep it occupied and exercise its jaw while cleaning its teeth and gums? Then your dog needs a Dino Bone! I hear you over there, asking how to get one of these amazing bones for your dog. It’s pretty simple, actually. There are three solid ways to go about finding a Dino Bone – or any of the Jones Natural Chews line – for your good dog.